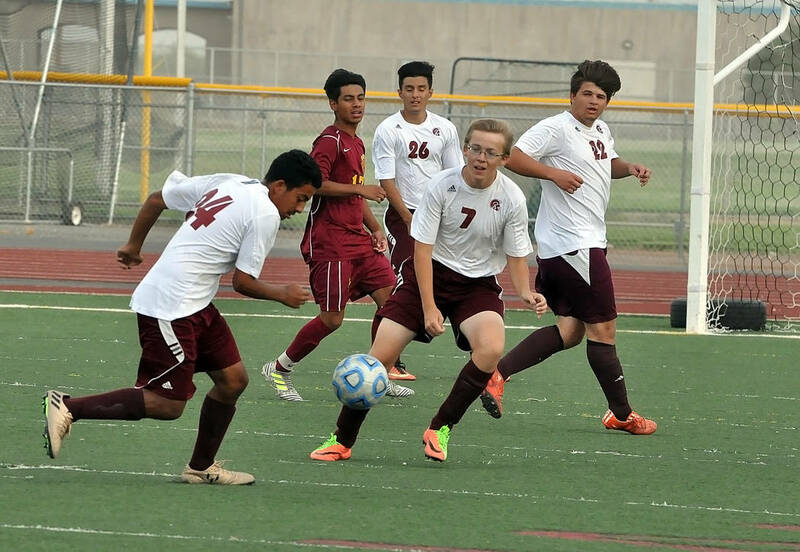 The Pahrump Valley High School boys soccer team lost its home opener 8-1 to Del Sol Wednesday in a physical game. Horace Langford Jr./Pahrump Valley Times Logan Dykstra and Christian Gonzalez go for the ball on Wednesday against Del Sol. The Trojans lost their home opener 8-1. Christian Gonzalez takes the ball downfield on Wednesday during the Trojans home opener. The Pahrump Valley boys team hopes to turn things around this year. Horace Langford Jr./Pahrump Valley Times - Christian Gonzalez takes the ball down field on Wednesday during the Trojans home opener. The Pahrump Valley Boys team hopes to turn things around this year. The Trojans went up against a team that finished 13-1-2 last year and was the Sunrise League champion. Del Sol showed it still had many offensive weapons from last year’s team, scoring five goals in the first half and three goals in the second. Good passing and ball handling were the key to the Dragons’ victory. They were able to pass at will. 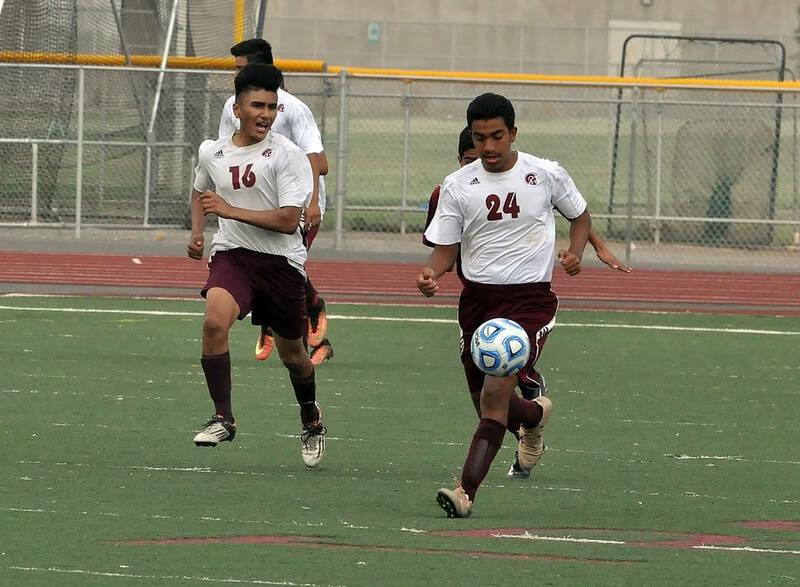 Ismael Veloz and Oscar Casimiro led the Dragons (1-0 overall, Sunrise League) in scoring, both had two goals. Yerovys Vargas-Gill, Abdul Aziz-Ahmed, Jose Moreno-Mendez, Richard Magallon-Escalera each scored one goal. Pahrump Valley’s (1-4-1 Sunset League) lone goal was scored in the middle of the second half off a corner kick by junior Christian Gonzalez with Jalen Denton scoring. At the Southern Nevada Tournament in Mesquite on Aug. 24-26, the team lost to Green Valley 5-1, Spring Creek 2-0, and Faith Lutheran 9-0. They tied Virgin Valley 2-2. The boys team has one victory under new coach Chris Roberts, against Somerset-Sky Point Academy on Monday, where they won 7-1. The Trojans travel up north to the Spring Creek Invitational for a weekend tournament. The boys next home game will be on Sept. 11 against Western at 5:30 p.m.